Metal doors offer great benefits in security and weather resistance, but to keep their surfaces welcoming and rust-free, you have to keep up with the painting. Here's how to brighten up a worn, scratched, or just tired-looking metal door with a fresh coat of paint. Steel doors are wonderful at keeping the wind and weather out of our homes, and they’re remarkably durable—they can last a lifetime. The paint that covers them, however, will not last that long. So, if your house has a metal door, at some point you’ll be faced with repainting it. As with any painting project, the final results will be directly impacted by your preparation, but it’s not an especially difficult DIY. Remove the door, if possible, and cover any parts of the door you do not wish to paint. Thoroughly clean the door with a degreaser. Lightly sand the door, then wipe it down to remove any lingering dust. Apply at least two coats of exterior satin or semi-gloss paint. Let paint dry completely, then rehang door. Continue reading for full project details on how to paint a metal door. Safety note: Before you dig in, note that doors painted prior to 1978 are likely to have lead-based paint on them. If your door does have lead-based paint, follow EPA guidelines for removal. If you have any question, have the paint tested prior to beginning this project. STEP 1: Remove the door, if possible. Before you get started, know that paint drying times and environmental factors can turn this into a multiday project. 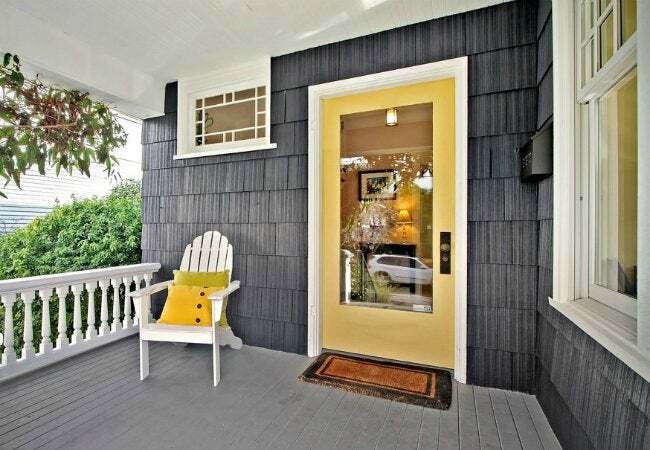 If you can’t secure your home without the door, you’ll need to paint it in place, which may take even longer. But if you can remove the door without compromising your home security, place a screwdriver under the head of the hinge pin and lightly tap it with a hammer until you’re able to pull it out. Repeat with the other hinges, and remove the door. STEP 2: Remove hardware and protect areas you do not wish to paint. Begin by prepping the door for painting. Once you’ve taken the door off its hinges, lay it across two sawhorses or on a large, flat surface. Take off any removable weatherstripping, and apply painter’s tape over any hinges or hardware. Protect kickplates or windows that can’t be removed by taping newspaper over them. STEP 3: Clean the door thoroughly with a degreaser. Wash the entire door thoroughly with a degreasing cleaner according to the manufacturer’s instructions, then dry the door with a towel. STEP 4: Lightly sand the door. Put on your dust mask and safety glasses and go over the door lightly with fine-grit sandpaper (or a sanding block) to rough up the surface and remove any loose paint. STEP 5: Remove all sanding dust and lingering debris. Wipe down the entire door to remove all the dust from sanding, and allow the door to completely air-dry. If your door has a smooth surface, roll on your first coat of primer with a short-nap roller, and let it dry. If your door has recessed panels, start by using a small brush to prime the inside panels first, then roll primer onto the mullion (the vertical section between the panels), and finally onto the rails (the horizontal pieces between the panels) and outside edges. Allow the primer to dry according to the manufacturer’s instructions, and apply a second coat, if necessary, the same way you did the first. STEP 7: Add two coats of paint, letting each dry completely. 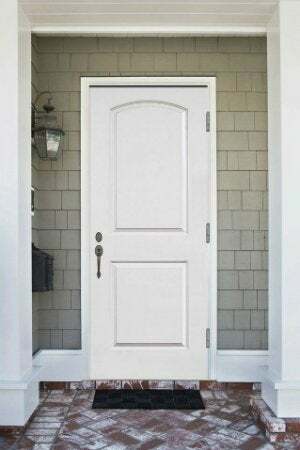 Paint the door with at least two coats of exterior satin or semi-gloss paint, following the same process you did for the primer and being sure to leave the recommended amount of drying time between coats. Note: If you have to paint the door while it’s on its hinges, plan to work over a stretch of days when there is no rain in the forecast. Prep the door one day, and then start your first coat of primer bright and early the next morning. If you start early enough, you should have time for the paint to dry before you close the door for the night. Get going on the second coat the first thing the next morning, with the goal of its being dry by nighttime. Continue in this fashion until you’ve applied as many coats as are necessary. STEP 8: Remove tape, replace hardware, and rehang door. After the paint has dried completely, carefully remove the painter’s tape and replace any hardware or weatherstripping you removed. Finally, rehang the door. It’s amazing how a fresh coat of paint on a door can really lift the spirits of an entire facade. If you allow time for careful preparation and sufficient drying, your rejuvenated front door will look great and welcome visitors for years to come.